Stats: 63.5 metres, Benetti, 2006, 12 guests, 18 crew Highlights: Lioness V is a great option if you are looking to entertain friends and family this festive period. She features a spacious salon and dining area that can easily accommodate 12 guests in style. To work off any excess Christmas calories she has a large gym, with a hammam, as well as a Tee-it golf machine on the sun-deck aft. Guests can also enjoy her elevated pool, which is surrounded by soft sunbathing cushions, and has concealed speakers to create a party atmosphere. Alternatively, jump straight in the sea from her swim platform and make the most of her extensive toy box. Where to find her: Lioness V will be available in the Caribbean this winter. 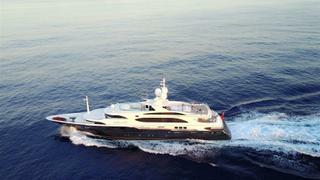 Lioness V is managed for charter by Edmiston and her weekly charter rate starts from €425,000. Highlights:Lioness V is a great option if you are looking to entertain friends and family this festive period. She features a spacious salon and dining area that can easily accommodate 12 guests in style. To work off any excess Christmas calories she has a large gym, with a hammam, as well as a Tee-it golf machine on the sun-deck aft. Guests can also enjoy her elevated pool, which is surrounded by soft sunbathing cushions, and has concealed speakers to create a party atmosphere. Alternatively, jump straight in the sea from her swim platform and make the most of her extensive toy box. Where to find her:Lioness V will be available in the Caribbean this winter. 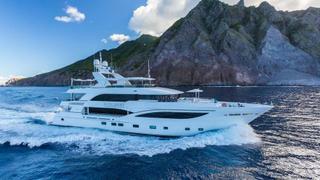 Lioness V is managed for charter by Edmiston and her weekly charter rate starts from €425,000. Stats: 74 metre, CRN, 2017, 12 guests and 22 crew Highlights: Cloud 9 is the perfect charter option for those looking for some fun in the sun this Christmas. Designed to make the most of the outdoors, she boasts a private deck forward of the master suite, a pool and a large beach club with extended platform at sea level. She also has an enormous selection of water toys, including a 14 metre waterslide from the sun deck, a water trampoline, anti-jelly fish sea pool and a jungle gym (as well as Sea Doos, jet skis, and a jet pack flyboard). After a hard day on the water, refuel at the espresso bar or kick back and watch your favourite Christmas film in her indoor or outdoor cinema. Where to find her: She will be spending the winter season cruising the Caribbean and Bahamas. Cloud 9 is managed for charter by Burgess with a weekly winter rate starting from $875,000. Highlights: Cloud 9 is the perfect charter option for those looking for some fun in the sun this Christmas. Designed to make the most of the outdoors, she boasts a private deck forward of the master suite, a pool and a large beach club with extended platform at sea level. She also has an enormous selection of water toys, including a 14 metre waterslide from the sun deck, a water trampoline, anti-jelly fish sea pool and a jungle gym (as well as Sea Doos, jet skis, and a jet pack flyboard). After a hard day on the water, refuel at the espresso bar or kick back and watch your favourite Christmas film in her indoor or outdoor cinema. Where to find her: She will be spending the winter season cruising the Caribbean and Bahamas. Cloud 9 is managed for charter by Burgess with a weekly winter rate starting from $875,000. Stats: 59.66 metre, Benetti, 2009, 12 guests and 15 crew Highlights: After a major refit in 2017, Andiamo boasts a plush interior by Patrick Knowles Designs, with light-satin wood and oversized windows throughout. She has six sophisticated staterooms including a full-beam master suite with a private observation lounge, as well as an open-plan main saloon and formal dining area. She also has an elevator serving all decks. After a Christmas feast prepared by Andiamo’s award-winning chef, guests can head to the sundeck jacuzzi and soak up some rays. Where to find her: This Christmas she’ll be cruising through the Caribbean and Bahamas. 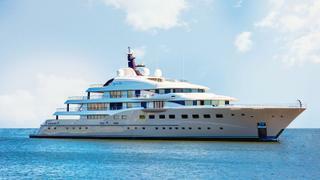 Andiamo is available to charter with IYC from $336,000 per week. Highlights: After a major refit in 2017, Andiamo boasts a plush interior by Patrick Knowles Designs, with light-satin wood and oversized windows throughout. She has six sophisticated staterooms including a full-beam master suite with a private observation lounge, as well as an open-plan main saloon and formal dining area. She also has an elevator serving all decks. After a Christmas feast prepared by Andiamo’s award-winning chef, guests can head to the sundeck jacuzzi and soak up some rays. Where to find her: This Christmas she’ll be cruising through the Caribbean and Bahamas. 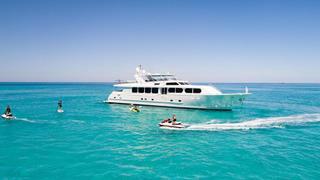 Andiamo is available to charter with IYC from $336,000 per week. Stats: 42.7m, IAG Yachts, 2016, 12 guests and 10 crew Overview: King Baby has been artfully designed with a rock n’ roll aesthetic, exemplified by the vintage furniture, ornamental guitars and curated rock photography throughout her interior. On the sundeck, an attention-grabbing three-tiered waterfall jacuzzi takes centre stage, enhanced by a swim-up bar for those who want to enjoy a tipple in the water. The lounge area surrounding these features includes multiple TV screens and an onyx-topped bar. King Baby is also fully-armed with a host of water toys, including fishing gear and a water-slide descending from the sundeck. Where to find her: King Baby will be cruising the Caribbean this Christmas, island-hopping between the Leeward Islands, Trinidad and Tobago and the Bahamas. 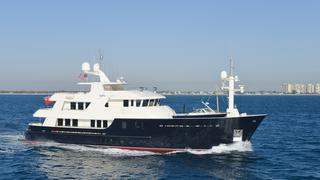 Managed for charter by Northrop and Johnson, King Baby’s weekly winter charter rate starts at $160,000. Overview: King Baby has been artfully designed with a rock n’ roll aesthetic, exemplified by the vintage furniture, ornamental guitars and curated rock photography throughout her interior. On the sundeck, an attention-grabbing three-tiered waterfall jacuzzi takes centre stage, enhanced by a swim-up bar for those who want to enjoy a tipple in the water. The lounge area surrounding these features includes multiple TV screens and an onyx-topped bar. King Baby is also fully-armed with a host of water toys, including fishing gear and a water-slide descending from the sundeck. Where to find her: King Baby will be cruising the Caribbean this Christmas, island-hopping between the Leeward Islands, Trinidad and Tobago and the Bahamas. 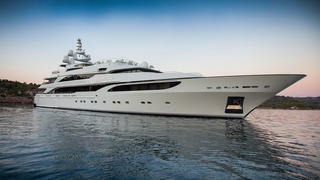 Managed for charter by Northrop and Johnson, King Baby’s weekly winter charter rate starts at $160,000. Stats: 39.31m, Newcastle Marine, 2013, 12 guests and 8 crew Overview: This unique luxury yacht is not only comfortable and spacious, but also environmentally friendly. Safira’s cotemporary interior has been designed with low-impact materials, including reclaimed oak and forest certified Sapele. Esthec has replaced teak for the deck and her engines run on 15% biodiesel. Safira has all the necessities for a luxury holiday. Her sundeck features a Jacuzzi, bar and barbecue, as well as various indoor and outdoor dining areas. An array of water toys and on-board gym equipment are also available to guests. Where to find her: Though Safira’s ice-strengthened hull makes her suitable for colder climes, she will instead be covering a large section of the northern Caribbean Sea this Christmas. She’ll be passing by the Bahamas, the Turks and Caicos Islands and the Dominican Republic, where some of the best dive sites can be found. Safira is managed for charter by Camper & Nicholsons with a weekly winter charter rate starting at $110,000. Overview: This unique luxury yacht is not only comfortable and spacious, but also environmentally friendly. Safira’s cotemporary interior has been designed with low-impact materials, including reclaimed oak and forest certified Sapele. Esthec has replaced teak for the deck and her engines run on 15% biodiesel. Safira has all the necessities for a luxury holiday. Her sundeck features a Jacuzzi, bar and barbecue, as well as various indoor and outdoor dining areas. An array of water toys and on-board gym equipment are also available to guests. Where to find her: Though Safira’s ice-strengthened hull makes her suitable for colder climes, she will instead be covering a large section of the northern Caribbean Sea this Christmas. She’ll be passing by the Bahamas, the Turks and Caicos Islands and the Dominican Republic, where some of the best dive sites can be found. Safira is managed for charter by Camper & Nicholsons with a weekly winter charter rate starting at $110,000. 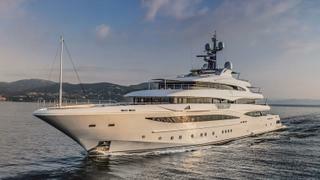 Highlights: Axioma is a sought-after charter yacht with celebrity credentials. Inside, she features a beach house-style interior by the late Alberto Pinto with natural woods and luxurious flourishes, six sumptuous cabins and a double-height main saloon with a mezzanine. After Christmas lunch guests can go for a dip aft deck infinity pool, drink some fizz at the swim-up bar, or take some of her many water toys for a spin. Where to find her: This winter Axioma will be circumnavigating the Caribbean and heading down to South America. Highlights: Three Forks is the perfect yacht for entertaining with plenty of spaces to sit back, relax and enjoy a festive glass of mulled wine. There's a sumptuous foyer in marble and cherry woods, an elevator serving all decks, and a sky lounge complete with a reading nook and a bar. Meanwhile, her sundeck offers guests further opportunity to unwind, with an oversized Jacuzzi surrounded by sun pads. Where to find her: Based in St Martin, Three Forks will be spending Christmas cruising the warm waters of the Caribbean. Stats: 44.8m, Intermarine USA, 2002, 10 guests and 8 crew Overview: Refitted in 2015, M3’s walnut and maple interiors have been designed in a classic style with marine blue soft furnishings throughout. All five guest cabins are completed with marble-finished en suite bathrooms. The master bedroom boasts a 3D TV for the ultimate cinematic experience, as well as a luxurious granite whirlpool in its ensuite. Large sun pads, a Jacuzzi and bar on M3’s sundeck create an ideal area for lounging and socialising, and a host of toys means she is well kitted-out for a variety of water activities. Where to find her: This winter season, M3 will be circling the beautiful Bahamas, perfect for guests hoping to enjoy an exotic Christmas. M3 is managed for charter by Ocean Independence with a weekly winter charter rate starting at $145,000. Overview: Refitted in 2015, M3’s walnut and maple interiors have been designed in a classic style with marine blue soft furnishings throughout. All five guest cabins are completed with marble-finished en suite bathrooms. The master bedroom boasts a 3D TV for the ultimate cinematic experience, as well as a luxurious granite whirlpool in its ensuite. Large sun pads, a Jacuzzi and bar on M3’s sundeck create an ideal area for lounging and socialising, and a host of toys means she is well kitted-out for a variety of water activities. Where to find her: This winter season, M3 will be circling the beautiful Bahamas, perfect for guests hoping to enjoy an exotic Christmas. 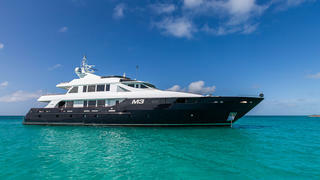 M3 is managed for charter by Ocean Independence with a weekly winter charter rate starting at $145,000. Where to find her: This Christmas swap cold winter weather for rum and sun in the Caribbean, where Blu 470 will be cruising. Stats: 83 metre, Amels, 2017, 12 guests and 25 crew Highlights: As one of the most expensive superyachts for charter, guests on board Here Comes The Sun are cocooned in luxury. For those looking for rest and relaxation this Christmas there are numerous spaces to unwind, including the beach club spa with overwater balconies and an elegant lounge. There's also a sundeck spa pool surrounded by sunpads and cabanas, a luxurious theatre and a large infinity pool with a swim-up bar. Where to find her: After spending the summer cruising the Western Mediterranean, she'll be heading to Mexico to explore the Sea of Cortez. 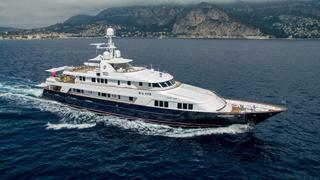 Here Comes The Sun is managed for charter by Fraser with a weekly winter charter rate from €1,200,000. Highlights: As one of the most expensive superyachts for charter, guests on board Here Comes The Sun are cocooned in luxury. For those looking for rest and relaxation this Christmas there are numerous spaces to unwind, including the beach club spa with overwater balconies and an elegant lounge. There's also a sundeck spa pool surrounded by sunpads and cabanas, a luxurious theatre and a large infinity pool with a swim-up bar. Where to find her: After spending the summer cruising the Western Mediterranean, she'll be heading to Mexico to explore the Sea of Cortez. 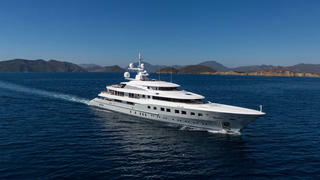 Here Comes The Sun is managed for charter by Fraser with a weekly winter charter rate from €1,200,000. Stats: 33.53m, Broward Marine, 2004, 8 guests and 4 crew Overview: Having undergone an extensive refit in 2017, Il Capo is in perfect condition for hosting a luxury yacht charter holiday. Inside, fresh linens and soft furnishings complement her simple wood-finished interiors. Il Capo’s highlights include a flybridge Jacuzzi and a sky lounge complete with a wet bar. Below deck, she boasts a light-filled and spacious saloon with panoramic windows. Il Capo is also equipped with a Donzi tender and a pair of jetskis, as well as fishing gear for those who prefer a less high-octane pastime. Where to find her: Guests on board Il Capo this Christmas can enjoy partying in the sunshine state of Florida or winding-down in the Bahamas. 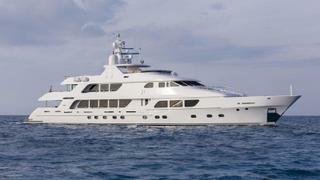 Il Capo is managed for charter by Denison Yachting with a weekly winter charter rate starting at $45,000. Overview: Having undergone an extensive refit in 2017, Il Capo is in perfect condition for hosting a luxury yacht charter holiday. Inside, fresh linens and soft furnishings complement her simple wood-finished interiors. Il Capo’s highlights include a flybridge Jacuzzi and a sky lounge complete with a wet bar. Below deck, she boasts a light-filled and spacious saloon with panoramic windows. Il Capo is also equipped with a Donzi tender and a pair of jetskis, as well as fishing gear for those who prefer a less high-octane pastime. Where to find her: Guests on board Il Capo this Christmas can enjoy partying in the sunshine state of Florida or winding-down in the Bahamas. Il Capo is managed for charter by Denison Yachting with a weekly winter charter rate starting at $45,000. Stats: 32 metre, CBI Navi, 2017, 7 guests and 6 crew Highlights: Indigo is a pocket explorer with global cruising capabilities and could be your dream charter yacht this Christmas. Recently refitted in 2018, she accommodates seven guests in three cabins, including a full-beam master suite accessed through a private stairwell. As well as an oversized swim platform, Indigo also boasts a large boat deck with a 4500-pound capacity crane that can accommodate plenty of toys and tenders - perfect for adventurers who want to explore the surrounding islands. 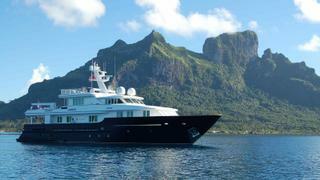 Where to find her: Indigo will be available to charter in French Polynesia, where she cruises all year round. Indigo is managed for charter by Yachtzoo with a weekly charter rate from €50,000. Highlights: Indigo is a pocket explorer with global cruising capabilities and could be your dream charter yacht this Christmas. Recently refitted in 2018, she accommodates seven guests in three cabins, including a full-beam master suite accessed through a private stairwell. As well as an oversized swim platform, Indigo also boasts a large boat deck with a 4500-pound capacity crane that can accommodate plenty of toys and tenders - perfect for adventurers who want to explore the surrounding islands. Where to find her: Indigo will be available to charter in French Polynesia, where she cruises all year round. Indigo is managed for charter by Yachtzoo with a weekly charter rate from €50,000.